Last Thursday the husband and I headed out to Avon Oaks Country Club for the Arthritis Foundation's 15th annual L'Amour du Vin presented by EMH Healthcare. The drive was idyllic as we drove through one of the best fall seasons I can remember. The air was crisp and the leaves were impressive shades of yellow, orange and red. Never having been to Avon Oaks before I wasn't sure to expect, but I did know that the Arthritis Foundation can throw one heck of a party. It turned out to be a superb evening of fine wine, food and friends. Upon arrival we headed to the VIP check in and were given wine glass pins, giving us easy access to roam between the general admission and VIP area. There we met up with Jen, Amanda, Alicia and their husbands, grabbed our wine glasses and were ready to start tasting. The main ballroom was packed with a silent auction and wines from every region imaginable. Sweet German Rieslings and Gewurztraminers, Italian Montepulcianos, wonderful blends and Cabernets from California, Malbecs from Argentina and Syrah from Chile were just a few of the offerings. There were too many to possibly try them all, but there was something for everyone. In the midst of all this wine there was a delectable array of food from restaurants I have yet to visit. As a resident of Ohio City, I unfortunately don't know much about the restaurant scene west of Rocky River. We have such a great culinary scene here that sometimes it's hard to get out of your own backyard. That's about to change because I sampled some pretty incredible food. Smoked gouda chicken mac and cheese from Wood & Wine, farfalle with roasted red pepper cream sauce from Ahern and mushroom risotto from Gatherings Kitchen were some of my favorite savory bites. Not to be outdone, however, Kiedrowski's Simply Delicious Bakery had an insane array of cupcakes, cookies and the biggest pumpkin roll I've ever seen. 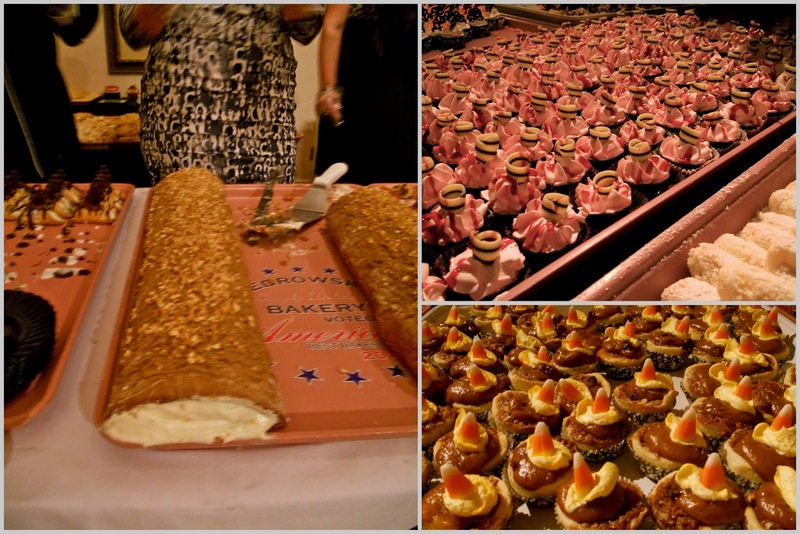 The 3 foot long pumpkin roll and heavenly cupcakes. I was a happy girl when we made our way back to the VIP area. But there was even more fun to be had. Even though I was getting quite full, there was no way I was turning down what AMP150 was offering. I may have snuck back to get a few helpings of pork belly with roasted corn and squash soups with five-spice pumpkin seeds. I cannot resist the pork belly! Keep an eye out next year, this is an event that you won't want to miss. I do love Kiedrowski's bakery, a hometown favorite.